We’d love your help. Let us know what’s wrong with this preview of The Beholder by Anna Bright. But after an excruciatingly public rejection from her closest childhood friend, Selah’s stepmother suggests an unthinkable solution: S Selah has waited her whole life for a happily ever after. As the only daughter of the leader of Potomac, she knows her duty is to find the perfect match, a partner who will help secure the future of her people. Now that day has finally come. Selah has waited her whole life for a happily ever after. As the only daughter of the leader of Potomac, she knows her duty is to find the perfect mat Selah has waited her whole life for a happily ever after. As the only daughter of the leader of Potomac, she knows her duty is to find the perfect match. To ask other readers questions about The Beholder, please sign up. I’m sorry I’ve been DNFing so much recently but I’m also not sorry because I also have way too many books I really want to read to waste my time. To sum up why I DNFed: nothing happened. I will not be seduced by beautiful covers. 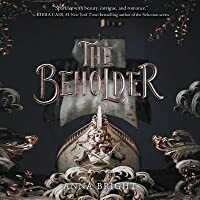 The Beholder is an enchanting read, full of myths and folklore. The premise drew me in quickly. Basically, we have Selah, who is the Seneshal-elect of Potomac (meaning she'll be placed in charge one day). Potomac (from what I gather) is an island somewhere between the coast of England and New York. In order to rule, Selah must marry, but when she proposes to the boy she loves, well ... let's just say it doesn't go as she suspects. So, scrambling to fix things, her stepmoth I really enjoyed this! 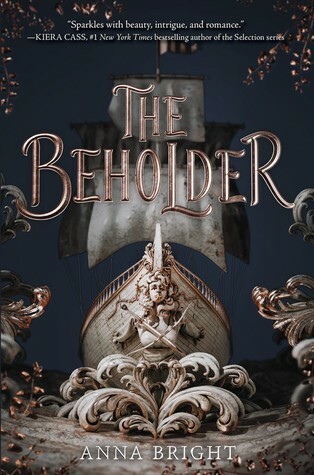 The Beholder is an enchanting read, full of myths and folklore. The premise drew me in quickly. Basically, we have Selah, who is the Seneshal-elect of Potomac (meaning she'll be placed in charge one day). Potomac (from what I gather) is an island somewhere between the coast of England and New York. In order to rule, Selah must marry, but when she proposes to the boy she loves, well ... let's just say it doesn't go as she suspects. So, scrambling to fix things, her stepmother orchestrates a journey across the sea aboard the Beholder, in order for Selah to find a suitable match. And she can't return until she's engaged. First of all, it wasn't what I expected at all. I don't know why, but I assumed it was a bunch of suitors on a ship together - hah, nope! Captain Lang, who Selah's stepmother hired, forces Selah along to each required stop. If Selah misses one, she risks offending said country/royal family. Worse, one of the last stops is extremely dangerous, where a scary Tsaritsya awaits. Knowing this, Selah hopes to find her fiancé in one of the first two stops, thus avoiding the third altogether. Anyway, perhaps the best part was the twists! The book is full of fun little surprises - my favorite being the one on the first stop. Even though I saw it coming from early on, I loved it! I'm eagerly awaiting book two! My only complaint is that I was thoroughly confused by the world. We have England and New York and I'm assuming some alternate version of Russia and Sweden - but everything had different names and I was scratching my head half the time. I had a hard time telling what time period we were in as well. Soooo I think this was supposed to be a world * like ours * but not *exactly* ours? There were so many terms I couldn't quite grasp as well. Either way, it didn't stop me from enjoying the book! Honestly, I binged most of it within two days because it was that addicting! And the writing was beautiful - I looooved how it had a whimsical/lyrical feel at times, while also being easy to read and follow. All in all, a great read! Enjoyed the story here! The writing sucked me right in and I couldn't let go. Selah was a great character when it came to speaking up and being strong, doing what she believed in. Loved that! Now, when it came to boys she was a litt Me: Never judge a book by its cover! Enjoyed the story here! The writing sucked me right in and I couldn't let go. Selah was a great character when it came to speaking up and being strong, doing what she believed in. Loved that! Now, when it came to boys she was a little weak. Boys! Boys! Boys! There were THREE boys she was infatuated in this book. Count them! One! Two! Three! I can't handle it! I will say it wasn't all at one time, though. I will also say that I loved them all, but still wished the book had only had one! But Torden, you are mine! but like, can we talk about this cover though? seriously though, this looks like something that should be hanging in some sort of estate or something. I can't wait to read it! thank you so much for the ARC! Buckle up, folks. This isn’t going to be a review. Let me start with my biggest issue. They seem to have taken it off the blurb now, but this book was marketed as an Odyssey retelling. It is NOT an Odyssey retelling. It has as much in common with The Odyssey as Harry Potter does. And, here is the key, frustrating thing: HAVING A CHARACTER CALLED HOMER WHO APPEARS FOR TWO SECONDS 🔴DOES NOT🔴 MAKE YOUR BOOK AN OD ARC received in exchange for an honest review - thank you! And, here is the key, frustrating thing: HAVING A CHARACTER CALLED HOMER WHO APPEARS FOR TWO SECONDS 🔴DOES NOT🔴 MAKE YOUR BOOK AN ODYSSEY RETELLING!!! ONE DESCRIPTION OF THE SEA AS ‘WINE-DARK’ 🔴DOES NOT🔴 MAKE YOUR BOOK AN ODYSSEY RETELLING!!! I can only assume that whoever came up with that marketing ploy has never read either The Odyssey or The Beholder. The only reason I didn’t DNF this thing, and thus give it one star, is because I was waiting to see if it suddenly turned into gods and sea monsters near the end. (Spoiler: it didn’t). ✴️ She’s naïve. She actually thinks she’s in a fairy-tale: she judges people based on their appearance. She trusts some random man because he has ‘kind eyes’, she distrusts someone else because they ‘smirk’. You know how in Disney films, you always know who the villain is, because they’ll always look evil? Well, to Selah, life IS a Disney film. Considering she’s supposed to be the next ruler of her people, I pity the folk of Potomac. All it’s going to take is one trustworthy-looking con artist, and BOOM – there goes the country’s budget. Linked to this is the fact that she’s a huge idealist. All three boys that she has a crush on throughout the course of the book – Peter, Bear, and Torsden – are described as ‘flawless’ and ‘perfect.’ STOP IDOLISING THEM, GIRL. ✴️ She’s far too emotional. Like I said, she’s the Seneschal-Elect, so she’ll be Seneschal when her father dies. She’s going to be a ruler, a diplomat. Which involves NOT spilling out your heart and soul to every-bloody-body you meet, which involves NOT crying in front of foreign delegations constantly, which involves a measure of discretion. I realise Selah grew up very sheltered, but surely these basic tenets have somehow impressed themselves upon her? Apparently not. Her emotions were on display for all to see, and I wanted to cringe on her behalf SO BADLY. She is going to be a shite Seneschal, because with the way she loudly broadcasts what she’s thinking and feeling, manipulating her will be easier than taking candy from a baby. She also gave her heart away FAR too easily – undying love is declared for at least two boys in the book, one of whom she’s known for a week. Helloooo, insta-love. ✴️ She’s incredibly passive. She knows that the crew tasked with ferrying her to all these countries to meet suitors are up to something shady. But she doesn’t even try to do anything about it. You know how Scarlett O’Hara’s motto is ‘I’ll think about it tomorrow?’ Yeah, that’s Selah. Why discover today what you can discover never? Who cares if it’s happening right under my nose and is clearly deeply shady? It was so painful to read about how easily Selah was put off from finding out anything about what was happening directly in front of her. She doesn’t do a single thing throughout the whole book. Plot is something that happens to her, she has no agency whatsoever. I can’t remember the last time I encountered such a weak, easily led heroine. Literally EVERY SINGLE THING THAT HAPPENS is done by other characters. The more I think about this, the more I realise how bad it really was. It was pathetic. Alright, I think I’m done with Selah. Let’s move onto the worldbuilding. MAKE UP YOUR MIND ABOUT WHAT KIND OF WORLD IT IS. It took me far too long to situate myself within the temporal frame of the world in The Beholder. There were clearly no planes, or electric light, etc. Selah is shocked to learn about what a radio is. So: old-fashioned. But then characters said things like ‘barf’ and ‘sure thing’, which in the context became ridiculously anachronistic. You can’t have it both ways! Selah’s attitude towards marriage was also deeply anachronistic. We’ve already established that this is a world where modern amenities don’t exist, where even though she’s going to be a female ruler she’ll need a husband by her side. But she acted like a potential suitor who was nine years older than her was a huge travesty. Um, no? In the actual nineteenth century, which this book was pretending to be set in, you were lucky as a ruler if your spouse was only nine years older than you! King William IV was 27 YEARS older than his queen, and that wasn’t even that shocking!!! This book flip-flopped ridiculously between old-fashioned and anachronistic. Not in a way that made Selah look like a feminist, just like a fool. Another example: she’s left her country to choose from a short list of pre-approved suitors (she doesn’t even know who’s on the list until it’s given to her), and then they’ll have a week of chaperoned courtship. Typical historical stuff. She’s making a political alliance to benefit her country, and she never once demurs. But suddenly, when it comes to her friend Anya, she’s all ‘Girls aren’t commodities! Let Anya marry whoever she wants, stop seeing her as a diplomatic chess piece!’ She’s apparently utterly blind to the fact that she is ALSO a diplomatic chess piece, and her rant didn’t feel assertive or feminist. Just dumb and lacking in self-awareness. The writing was fairly bland. When it came to relationships, there was lots of showing, not telling. Selah somehow feels like every one of the crew members of The Beholder is her family. How??? Why??? When did this happen?!?! The crowning moment came when she declared that Skop, a boy she’s exchanged three words with since she first met him, was like a brother to her. No wonder she falls in love at the drop of a hat, if people she’s spoken twice to mean that much to her. In fact, every single member of The Beholder’s crew feel as thin as paper. So why have I given it two stars and not just one? Because I was slightly charmed by this thing the author did, where there was an allusion in many of the characters’ names. Perrault, Anderson, Homer… there’s even a horse named Cotton Nero, which is the manuscript Sir Gawain and the Green Knight comes from. Speaking of Sir Gawain, there was a weird little attempt to weave in elements from that story, but it fell very flat. I’m honestly not sure why it was even there. The description of Norge was also great, but the one of Winchester severely lacking in terms of making me feel like I was actually there. This book is, largely, a huge disappointment. Will I read the sequel? Probably not. Don’t be seduced by the cover, or its claims to be a retelling of any sort. If you love falling in love with fictional characters, you're going to love this book. I’m almost 100% that this is the (view spoiler)[Fairyloot May box book (hide spoiler)]. And I’m super excited for it. You all know I'm living in my Odyssey retelling trashcan for life. Hype! A stunning, sweeping tale that combines elements of beloved classics and yet is somehow entirely original. A unique and unforgettable fairytale. This ARC was provided via Edelweiss in exchange for an honest opinion. Thank you HarperTeen! Let's begin with retelling thingy. It wasn't really a Cinderella or Odyssey retelling. Ok, we have a bad, selfish, greedy, and manipulative stepmother. We have Homer, and Penelope is making an appearance once or twice. We have Baba Yaga too. A tale of Saint George. Well, there is a lot of tales in this book. I wouldn't call this book an exact retelling since those storie This ARC was provided via Edelweiss in exchange for an honest opinion. Thank you HarperTeen! Let's begin with retelling thingy. It wasn't really a Cinderella or Odyssey retelling. Ok, we have a bad, selfish, greedy, and manipulative stepmother. We have Homer, and Penelope is making an appearance once or twice. We have Baba Yaga too. A tale of Saint George. Well, there is a lot of tales in this book. I wouldn't call this book an exact retelling since those stories can vary (and they do) from the original. It's more like our protagonist experiences those stories herself, they are intertwined into the main story. So keep that in mind. Selah, our main character, is a girl of a kind heart. She won't scream, she won't fight. She might appear naive at times. She doesn't really oppose other people. However, she is growing up with the storyline. She starts to be braver despite being a shy and scared girl at the beginning. Probably the best feature of this book. Anyone who likes books with multiple romances would enjoy it. I'm yet to wait for a prince I will cheer for, so umm, sorry? Wow, so much better than I ever expected. I need the sequel NOWW. @HarperTeen, you should totally put rose gold foil on the cover. Just saying... that would be a thing that is cool. This is a completely unbiased opinion and totally not influenced by the author AT ALL. Sigh, this is going to be tough. Just to start, do not be deceived by the blurb and think this is an Odyssey retelling. It is not. Let it be known that this book has nothing in common with the legendary Odyssey, unless a ship, a royal heir, and the sea are your words to describe it. The novel starts with a rejected proposal (not a spoiler), and a Kingdom that for the life of me I could not understand. Is it fictional?Is it present day Europe? Who knows? The main character, a young Royal Princess of Potomac, Selah, has been waiting to get married and live her happily ever after. However, she is rejected by the only man she’s ever truly loved. Her misfortune is her stepmother’s fortune as she decides to send Selah away in search of a husband. So, the stepmother organises an entire cruise (? ), and at each stop Selah would meet a potential suitor. The deal is that Selah can only come back once she finds a suitor/husband. There are other fun bits, right out of a fairytale, like Selah’s good father slowly withering away into nothingness even though he is King, the Stepmother/Queen being pregnant, the Stepmother taking over the counsel as the King is very sick. "Bharat's revolt had meant the begining of the end of the British Empire - and, for a time, of all empires." I mean, I am really tired of YA fantasy portraying polarizing views of good versus evil, can we at least get some back-story for the character before we deem her as evil? Anyway, back to the book. One would think that after being rejected, Selah would learn her lesson and harden up – unfortunately not. Apart from having the absolutely worst world building – which I could not understand a bit – the book’s main character is unbearably dull and naive. Not only does she act as a subservient chamber maid in front of the Captain, but she doesn’t even protest to this whole scheme that her stepmother has laid for her. There are attempts within the book to make her seem very feminist, and ‘woke’, but those just seem dumb because this was the ,early 1800s, 19th century, so how about we play a little with time, but don’t entirely change the customs. And even if the author does want to change certain things, it would be a good idea to provide a basic idea of what the world is like. Due to the unclear world building, I just had to rip it off of our, real world in the 19th century. I’ll be very honest, after the 200 page mark I had started skim reading. It was extremely difficult for me to understand which part of the world they were in, and what were the fantastical aspects. "'Yes, and don't go poking around', Lang said sharply. I stared at him, and he hesitated. 'Fine' I crossed my arms a bit taken aback." Finally, the biggest qualm I have about the novel were the love interests. Initially I thought it could be Captain Lang, and that kept me going. However, I was so disappointed with the main character’s love choices and choices in general. I won’t say much on the topic, in case I give away something but honestly, there could not have been a duller, more lack-lustre female character in the whole of my fantasy reading years. And the first person perspective just made her more infuriating. The other characters too were like props, of no significant value. And to top it all off; the writing. I get it debut writers would use a bit of tropes and some other clichés as they are just starting out, but the writing style was not my cup of tea. It made me actually want to sit with a pencil and start changing paragraphs, and fleshing-out characters. Literally, the only character I liked was Godmother Alethea. So final verdict: no. I was waiting for sirens, and Gods, or maybe even Pegasus; but what I got instead was a boring female character, absolutely horrendous world building, and a narrative that put me to sleep. I like this sentence, too bad every man Selah is interested in is described as the most handsome man who ever lived. 3 Stars— Thank you to Edelweiss for providing me with an arc in exchange for an honest review. First, I didn’t find this to be anything like the Odyssey or Cinderella. Don’t let this factor sway you. It was a unique book, but I’m not sure it was unique in a good way. I did not think the alternate earth with fairytale stories married well. It took me out of the story and stilted the plot. Selah is our MC. She’s a bookworm who loves to garden and wants to take care of her father and people. She annoyed me at times, which was strange because I often imagined myself as her because she is described to have similar features as me. There are so many other characters I don’t even know where to begin. It was very difficult to figure out who was who. I had a hard time imagining most of the story because there were too many characters. There were times where I thought the setting was alright, and other times where I couldn’t imagine the world at all. The descriptions were just ok to me. There were some sweet moments between characters. I loved what the author did with the characters names. Perrault and Homer etc. She is in love in nine days. I really don’t like insta-love or love so quick it doesn’t seem real. To me it felt as if she were with Torden for well over a month, but the story gives her around twelve days with each suitor. Torden and Selah were off on rides or walking through the barley fields. The author could have given it a longer time and it would’ve been more believable. It wasn’t just the love story which made no sense to me. I felt the relationships with Selah and the crew of the Beholder had no time to develop. But towards the end of the book Selah refers to one member of the crew as her brother. This was a character who I didn’t even remember from her first stop in England. I think the reader was supposed to assume because Selah was traveling she had time to get to know her crew, but this is something the reader doesn’t experience and therefore was difficult to grasp. This is the type of book that is setting up for the second book of the series. I just found it frustrating and slow. The end of each chapter didn’t leave me wanting more and the reader was near constantly reminded how if Selah doesn’t find a man she won’t be able to get back to her father. Plot points that were supposed to be tense felt silly and irrational. I don’t understand or relate to the logic Selah uses to justify a lot of her actions. I get that its to have her travel from one place to another, which is why it felt forced having to rip her away from her insta-loves. This book is a gem. YA is rife with heroines who are assassins, warrior queens, etc—in all of that, Selah is a breath of fresh air. A teenage protagonist who actually feels like a teenager, with all the sweetness and heartbreak and stormy emotions that comes with it, who is allowed to be soft and feminine in ways that the story always treats like strengths rather than weaknesses. Deftly written alternate history, steadily mounting stakes, and SO MUCH ROMANCE make this super fun to read. ✨ Review copy provided by the publisher in exchange for an honest review. Once again it’s 3 am and I’m trying not to sob at work. Excuse me, but how am i supposed to go on with that ending?!?! TORDEN deserves happiness. God Selah’s growth was beautiful. I’m so broken, I’m so sad. 😭💔 yet so so proud of the character that Selah chose to be after living as a pawn for so long. I NEED BOOK TWO NOW!!! The Selection? Cinderella? Odyssey? mixed? Thank you Edelweiss and HarperTeen for the ARC. I really struggled rating this one. Selah’s growth and continued gained confidence. I’m very intrigued and invested in the larger story that’s being told around the whole “Selah’s visiting suitors” plot. I’m wondering if several characters will make a reappearance, because I’m super curious about what’s happening to them next. Personal preference, but I don’t like polygon romances, especially when there’s insta-lust/love/attr Thank you Edelweiss and HarperTeen for the ARC. Personal preference, but I don’t like polygon romances, especially when there’s insta-lust/love/attraction. I knew going in it was a romance, and there would have to be some attraction, but falling in love in two weeks just . . . No. Because of said insta issue, Selah can come across as fickle and flighty, which can be forgiven a bit if you consider the fact she’s never left her homeland before. The suitors all seem very one dimensional to me. A lot of the secondary characters seem one dimensional and flat. Seems more Cinderella than Odyssey. Did I enjoy the book? Overall, yes. Will I recommend it to patrons? Yes. I think there are several that would enjoy this one. This book had a bit of a slow start for me but once it got rolling I devoured the rest in one sitting. The Beholder takes you on a world-wide adventure with schemes and politics, lots of romance, history and other cultures, and so many emotions. I loved all of the nods to the classic fairytales and it definitely had a small hint of ‘The Bachelor’ vibe. Watching Selah’s personal growth made me so proud and I can not wait to see what she does next with her new sense of self. And oh, the ships!! So many ships! I think I have a favorite… but we’ll see! Overall, I really enjoyed my time reading this one and am very much looking forward to book 2 and what will come next! All quotes are taken from an advanced reader’s copy and aren’t final. Please refer to a finished copy. **note: i don't accept GR friends anymore, because of amazon review policy I believe in woods, mountains, highways, cobblestones, roller coasters, dancing, concerts, cherry Pop Tarts, books, and magic.